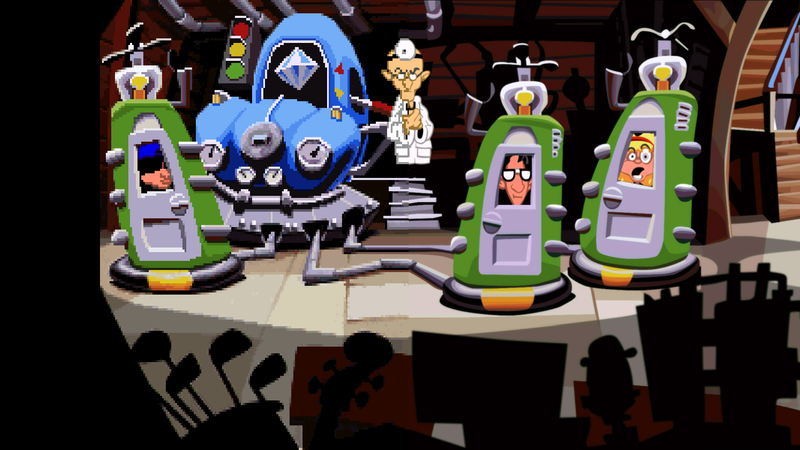 I’ve always been a fan of Lucas Arts’ games and for me, it all started with Day of the Tentacle. When Double Fine Productions announced that they were remastering one of my favourite games I was over the moon, but the joy was a little hindered when I watched the trailer and discovered they were sticking to the games original framerate, but that’s not too bad in all honesty. 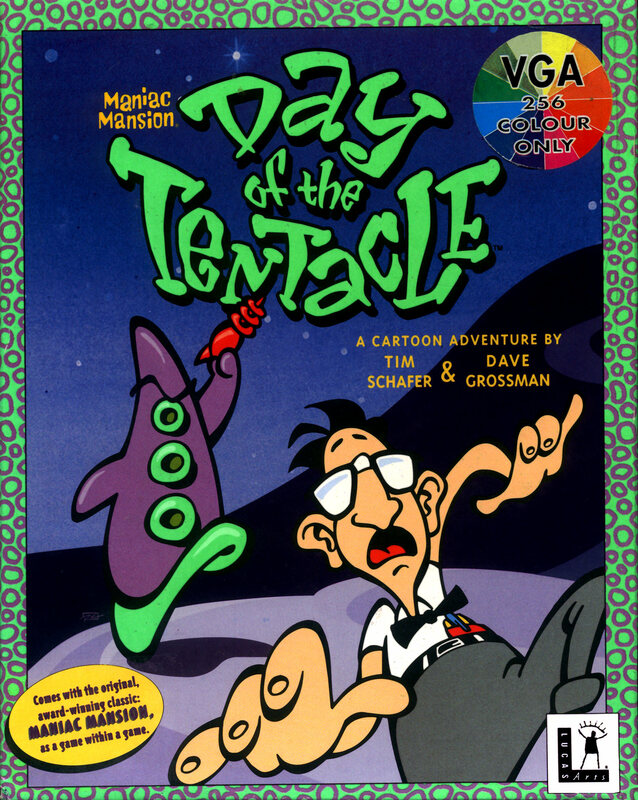 Day of the Tentacle was first released back in 1993 by Tim Schaffer and David Grossman and was the spiritual successor to Maniac Mansion which thankfully is still playable in-game. Continuing the theme from Maniac Mansion you play as three characters, Bernard, Hoagie and Lavern, and you must stop the evil mutated Purple Tentacle who plans to take over the world. The plot takes a sour turn when Purple Tentacle travels through time leaving the three no choice but to follow him, but a catastrophic failure separates them, causing them to end up in different times, past, present and future. After the three adventures throughout time, all three return to the present and must find a way to put a stop to the evil tentacle’s dastardly plan. Although it is fun to return to the mansion again, it seems that nothing much has changed. The graphics having been updated still don’t seem nothing fancy, just cleaner and more refined for 1080p, but the frame rate is the same as the original which leaves a clunky feel. The audio is much improved and makes the most out of today’s new and improved MIDI engines, allowing for higher quality and well-sampled audio. It is nice to hear the clearer and snazzy music but in my opinion, it would’ve been nicer to hear real instruments. The sound effects are where the remastered edition stand out, having been mostly replaced which higher quality sounds and some have been changed completely which really compliments the game. Because of original games age, the original voice clips will have been used in the remastered edition. This is because Lucas Arts most likely saved the voice audio as .WAV files, the industry standard for digital recording before compression was available, but they were very large files and this is why the voices were only available on the original CD release of the game. The part where the remaster shines the most is in its updated engine. If you’ve played Double Fine’s other awesome point ‘n’ click adventure, Broken Age or Grim Fandango, then you will feel somewhat comfortable with the Day of the Tentacle remaster as it is very much the same engine. Again like Broken Age, you can swap between cartoon graphics to the old retro style, although Broken Age didn’t actually have a previous release like Day of the Tentacle had, but the real effect with the retro graphics is that it brings back the classic item tray giving it the feel of the original. I am a huge fan of Day of the Tentacle and I won’t lie, the remastered edition was a great experience, but it wasn’t really much of a remastered experience, it just felt shiny and HD ready. The updated graphics were pleasurable but sadly lacked due to it staying with the original frame rate for the animations, although that can be looked past and you do tend to not notice it as much, but I would’ve liked things to be a smoothly animated as Broken Age. I would recommend this to anyone who hasn’t played the game as it is and always will be a great game in my books. To anyone who still owns the original game disc, I would recommend copying the contents to your computer’s hard drive and running the game through SCUMMVM which emulates any of the old Lucas Arts games that were created in SCUMM engine like DOTT. Pros: A fun storyline, great voice acting with a hilarious script, has amazing replay value just for the fun aspect, can swap between retro and remastered graphics/gameplay on the fly. Cons: No difference in gameplay, further gameplay can lead to completing the game in as few as two hours, remastered gameplay isn’t as well laid out as retro style. 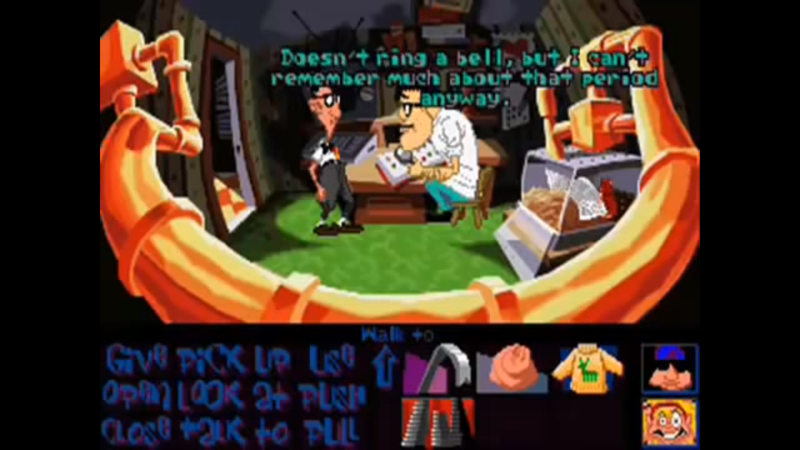 While scores are difficult to track down, DOTT frequently appears in top 100 Games lists of all time and won 1994’s Adventure Game of the Year according to Computer Gaming World. TwitchStreamer || VoiceActor || Musician || Music, Gaming and Tech is pretty much 100% me. What a classic… I never finished (shame, I know). Actually, next week is Day of the Tentacle’s 25 Anniversary and I was thinking about finishing the game and making an special feature. Now I need some time. Excellent post and thank you! I always sucked at Point and Clicks,it wasn’t until starting this site I finally beat one.